When we observe large schools of fish swimming, we might wonder who is choreographing that complex and sophisticated dance, in which thousands of individuals move in harmony as if they knew exactly what to do to produce the collective spectacle. 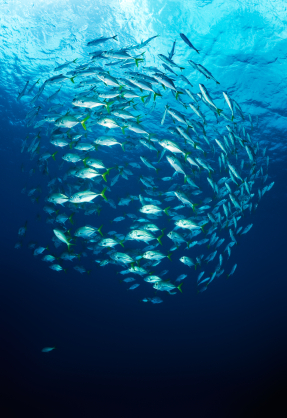 School of fishes dancing is an example of “emergence”, a process where new properties, behaviors, or complex patterns results of relatively simple rules and interactions. One can see emergence as some magic phenomena or just as a surprising result caused by the current inability of our reductionist mind to understand complex patterns. Whichever way we think, examples of emerging behaviors are abundant in nature, science, and society and are just a fact of life. We humans have even built artificial environments that allow for collective intelligence to express itself. For example, in global financial markets, we are able to track and analyze millions of variables (e.g. weather patterns in India, political tensions in the middle-east) to price thousands of commodities and more complex financial instruments in real-time. Each and every actor in the financial markets has no significant control over or awareness of its inputs. They are just trying to follow a very simple set of rules: buy low, sell high, maximize profits. Regulators try to enforce the rules to keep the game fair, but there is no central coordination in the computation of prices. Commodity prices results from the interaction among investors, not directly from their individual knowledge. As any economist will explain, the financial market works best when there are enough participants so that no individual has meaningful influence over the aggregate result, everyone plays by simple transparent rules, there is low friction in the interactions, and each participant is autonomous and responsible for its participation. Can we transpose it to other domains? When it comes to other areas of human knowledge, because spoken or written language has not been a tool as perfect as buy/sell in an exchange or the intuitive reactions of a fish observing its school mates, we have resorted to structure to create productive patterns (as in a group of soldiers marching at the beat of a drum). Digital Media is still far from frictionless, but it getting close to allow millions of people to interact more or less freely. Environments like Wikipedia and primitive Q&A sites are the initial samples of that. Nobody can single-handedly create “collective intelligence”. But Ledface is building an environment that empowers individual knowledge and aggregates it (like Wikipedia), but also provides the mechanisms for interactive co-creation (differently from other Q&A sites) so that, maybe, the conditions are right for the emergence of true collective intelligence.